Brevard College’s move to DIII positions Brevard with schools similar in size and resources such as the Methodist University who the Brevard College Tornados Football team recently competed against. The Brevard College Tornados Football team (1-3, 1-1) earned a well-deserved victory over the Methodist Monarchs (1-3, 1-1) with a 41-36 triumph. Scoring was plentiful in the second quarter of this USA South showdown. Tyler Gregory hauled in a 56-yard strike from Dalton Cole, taking it all the way to the Methodist one-yard line before being tripped up. On the next play, Gregory lined up to take the direct snap and powered his way to give the Tornados a 6-0 advantage. After the Monarchs found their own quick strike to claim a 7-6 lead, Brevard College answered the call to action. A 70-yard drive was capped off when Gregory took a direct snap inside the five. The versatile athlete would issue a shovel pass to running back Bobby Clerisier, and Clerisier found the end zone to give Brevard College a 13-7 edge. Special teams played a large role in the outcome of this game. The first instance of this would come on Methodist’s next possession. After the defense forced a three-and-out, defensive back Treveon Charles blocked the Methodist punt try. Fellow defensive back Andreas Wyatt scooped the blocked punt attempt in the end zone, resulting in another Brevard College touchdown and a 20-7 lead. Methodist would go on to score two more times to take a brief 21-20 lead. This one point advantage proved to be the only time Methodist would hold a lead over the Tornados on the afternoon. Once again, special teams would help out the team. 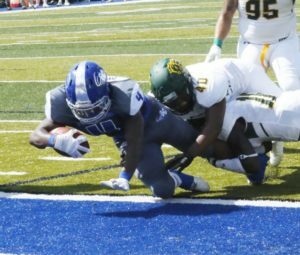 Charles, who already tallied a blocked punt in the contest, would take the ensuing Methodist kickoff 84 yards, reaching the Monarch one-yard line before being tripped up. Just two plays later Cole leapt over the offensive line en route to a one-yard touchdown run. Andreas Wyatt picked off Methodist quarterback Steve Keoni to ensure that Brevard College would take a 27-21 advantage into the locker rooms. On the first drive of the second half, Cole found Martigus Henley on a 59-yard strike. THe Tornados would enjoy a 34-21 cushion after Henley’s score. Henley’s scoring wouldn’t stop there. The Mearsville, Ga. native found the end zone once more on a four-yard strike from Cole, putting Brevard up 41-24. This score was set up by a Methodist fumble recovered by senior defensive end Axel Easter. The Monarchs produced a 59-yard drive to start off the fourth quarter, but the Brevard College defense would not be deterred. Freshman sensation Kaleb Woods forced a crucial fumble that was recovered by Quentin Jackson. Trailing 41-30, Methodist found the end zone once more in this game. An interception would give the Monarchs one last shot to reclaim the lead. The Tornado defense rose to the occasion, as the drive resulted in a turnover on downs, sealing Brevard College’s first victory of 2018.